It is a wonder how life’s seemingly mundane experiences spur profound milestones in the journey to self-discovery. Filmmaker Nila Madhab Panda would certainly have a lot to say on that. The 37-year-old’s I Am Kalam is well on its way for an exclusive screening at the world’s biggest children festival — The National School Film Week, London — on October 14. Already riding on strong promise, the film, produced by Smile Foundation, has managed to bag the best feature film award and the Don Quixote Prize of the International Cine Club Federation at the Lucas Film Festival, Frankfurt Germany. “I come from one of India’s poorest regions, a remote village in Orissa’s Sonepur district. I know about daily struggle. But I also know what aspiration is. It’s a story of struggle that I have faced in my childhood,” says Panda. “I’m an eternal positivist. There is so much of negativity today, be it climate change or corruption. But I look at the spirit that instills fighting instincts against overwhelming odds,” he adds. Strong on the social message of the need for education, the film is a celebration of struggle, aspiration and success. It also has a strong take on child labour, the exploitative Indian system and the thoughtless individual. The child protagonist in the film, Chhotu, works as an errand boy in a roadside dhaba. His name is suggestive of a generic identity for all child workers where no one gives a damn about them. He recognises his life’s purpose when he’s asked: “What is your real name?” He realises that he wants a real name with a character, unlike the countless faceless Chhotus. He needs a hero and finds his answer on TV — APJ Kalam, a man who scaled the pinnacle of achievement, an individual who financed his school fees by selling newspapers. 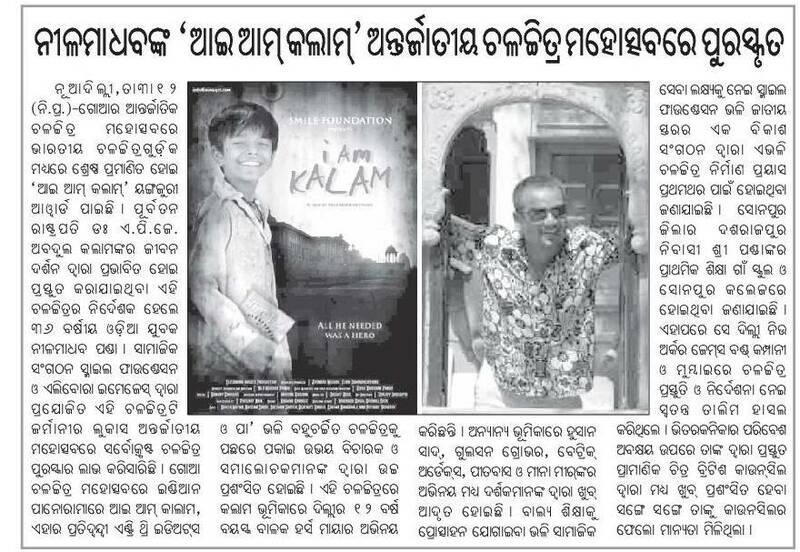 I Am Kalam had its world premiere at the Marche du Section of the Cannes film festival this year. Having produced and directed over 65 documentaries, shorts and films across the globe, Panda is a promise among India’s emerging generation of young filmmakers. His contemporary storytelling methods offer a skillful and visually striking edge to social themes. Balangir, Sept. 19: Former President A.P.J. Abdul Kalam’s “early life and vision” has been captured on reel to convey the message of education to the deprived millions in India. The film I am Kalam is already going places and has won the best feature film award and the Don Quixote Prize at the Lucas International Film Festival in Germany. Produced by the Smile Foundation and Eleeanora Images Private Limited, the film had its world premiere at the 63rd Cannes Film Festival last May and will now be screened at the prestigious London Children Film Festival and Asia Pacific Screen Award. Few, however, know that Nila Madhab Panda, co-producer and director of the film, hails from a non-descript village in Sonepur district. Set in Rajasthan, the film is the story of Chhotu alias Kalam, who cannot aspire for education because of his family’s poverty-stricken status. Through an entertaining and fast-paced narrative, the film takes the viewer to the world of Chhotu, who at one point starts referring to himself as Kalam after watching the missile man speak on television about how he got his education fighting several odds. Chhotu’s life takes an unexpected turn as he befriends Prince Ranvijay. His father, an erstwhile “king” of a princely state, runs a heritage hotel at his ancestral palace across the street, where Chhotu goes to deliver tea to the guests. The kids bond big time and Chhotu starts getting his education informally, courtesy Ranvijay’s old books and interaction with costumers. The film strikes a chord with the viewers thanks to the heart-touching acting by Delhi slum boy Harsh Mayar. Mayar as Chhotu represents, in a way, millions of other kids who could become Kalams but for the unfortunate circumstances they find themselves in.